Well, my sleep-deprived emotions caught up with me last Wednesday and I just broke down and started crying, "I'm just so tired." Well, I had to run out to the grocery store and promised Josh I'd "be back so soon". I wasn't ready to venture out to the store with all 3 kids yet. Josh, being the sensitive man that he is, decided that he'd give me a break and took an adventure of his own. While I was gone he got the kids breakfast and began packing a picnic lunch. He got a bottle for Cai and loaded all 3 of the kids up in the car and took off for a park and the library for a daddy day! He, not I, was the first to attempt an outing alone with all 3 kids! I couldn't tell him thank you enough for the time to get caught up on things around the house and for just giving me a little "me time". I know what you are thinking..."you've got it SO good"! Don't you think that I already know that?! It also makes me have a deeper respect for single mothers who do it "on their own" from day one. It just makes me more thankful for the helpmate God has allowed me to have in Josh! 2- The TV series, Burn Notice. Josh and I have been watching it on Hulu. Besides some language and the fact that the female sidekick dresses terribly it is absolutely hilarious! 3- Naptime! The time between 2:30(ish)pm-4:30pm I am absolutely kidLESS. After Micaiah eats at 2 I put ALL 3 KIDS DOWN FOR A NAP! I either get caught up on my own sleep at that time;) or get some office work done. 4- Pita Chips - All natural chips made from pita bread. Delicious! The best part about it is that I still have money left over in our grocery budget and I have 4 more packages of diapers to add to our Cai supply! I took a couple of weeks off due to Micaiah making his entrance into the world, but boy did I pick the right time to jump in! Harris Teeter is doing another week of Super Double Coupons. This means that they double ALL coupons up to $1.99 (only 20 coupons per day). Above is a picture of what I got yesterday. I have another 10-15 coupons to use today since I made the 20 coupon a day limit yesterday. Just to tell you how good I didn't even have a coupon for any of the produce, the 2 OJ's, or the cheese. That should tell you that the rest of the deals I got were either FREE or SUPER CHEAP! If you are around young kids for any time at all you know that you have to "sneak" food around if you don't want to share it with them, especially the kind with chocolate and sugar in it. 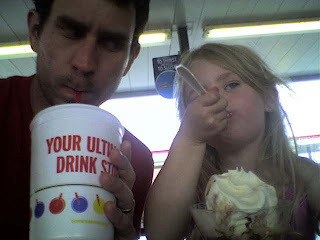 Well, when I was pregnant I had the perfect excuse to eat or drink whatever I wanted to in front of the kids. If one of them asked, "Mommy, what are you eating?" or "What do you have?" I would simply respond with "Oh, it's just something for the baby in my tummy." After explaining one time that "the baby has to eat too" it just became normal to them when I'd snarf down a snickers or chow down on some other kind of yummy snack. Well today, after snagging my usual CVS deals/freebies, I came back out to the car where Josh sat, waiting, with Areyna and Zeke. I had gotten 2 Reese's packs for free, one for me and one for Josh. I was needing my usual chocolate fix and started eating mine right away. After inhaling my 2 peanut butter cups I placed the wrapper in the cup holder in eyesight of Zeke who was sitting in the backseat. Without hesitation he asked "Mommy, what did you have?" I automatically replied with my usual response "Oh, just something for the baby." He looked at me out of the corner of his eye as if to say, "I know better than that" and said "What baby?" A Daddy Date was WAY overdue for Areyna and her daddy. Josh had to take his guitar in to get some work done on it and he asked if he could take Areyna with him and then take her on a date. I thought it was a GREAT idea! 2 Bucks, you can't beat that! Josh got the 'ol GPS out and did a search for "Parks" and this Nature Park came up really close to where they were so they thought they'd go check it out. What a find! It's got just a regular park, nature trails, hands-on exhibits and a nature center with nature and animal exhibits. Areyna couldn't stop talking about it, she had a blast! 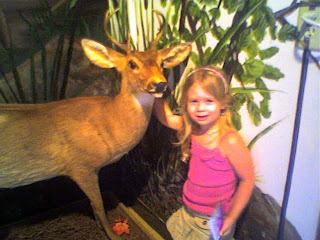 Areyna next to a stuffed dear. 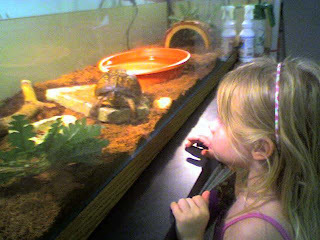 She didn't quite understand why some of the animals were dead and "frozen" but she loved seeing all the different kinds of animals. 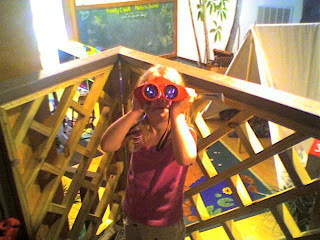 Checking out one of the exhibits with binoculars. They even got a cool map that showed them where to go. Areyna was the guide and pretty proud of it! There isn't much to blog about today. Just a catch-up day. I've had a few things to get done in the office so I've been busy trying to get those things checked off my list. Josh just took Areyna on a "Daddy Date" so it's just been me and the boys this afternoon. What have you done this Monday? 5- Taking more dates in the past 2 weeks than in the whole past 2 months combined! Areyna: "Mommy, I want to feed Micaiah." Me: "Well baby, I don't have a bottle ready for you to feed him this time." Areyna: "No I mean from my boobies." Zeke: "Mommy, do you have any cookies in there for Micaiah?" Clearly cookies and milk are supposed to go together! Pumping has been an interesting phenomenon for them as well. They look on, wide-eyed every time I get the contraption out. Have you had any "fun" experiences with siblings like this? Areyna LIKES to talk to Cai while I'm feeding him. It helps keep him awake! The kids HATE that Cai sleeps so much. They hate it even more when I put him to sleep in his bed. They like his presence. Micaiah LOVES to hear his daddy practice. I heard him start crying the other day but as soon as Josh started singing Cai stopped to listen. This is very good, since the office shares a wall with his room. I don't think there is any part of being a dad that Josh dislikes:) He is such a GREAT daddy! I had my first experience with the kids by myself on Saturday. Josh had a gig at Limestone College all day so I was on my own with all 3 of the kiddos. It went fairly well for my first attempt=) The whole day went pretty smoothly until the bedtime routine began. We already have quite the routine but it was also bath night (that means church the next day;) and Micaiah was due to eat at 7:30pm, right smack dab in the middle of it all. Josh said he would have paid to watch me juggle all that;) He pictured me feeding Cai while washing Zeke's hair in the bathtub all at once. Although I'm sure it can be done I was not brave enough to try that one yet. Luckily, Cai is a GREAT baby and can hold off pretty well. I got the kids bathed and dressed and all ready for bed then I stuck them in an "extended" book time so I could feed Cai=) I told them it was going to be a little crazy for mommy to get used to having 3 kids to take care of at one time so "please be patient with mommy". Of course Cai decided to take his time eating his dinner. The kids had such a long book time that they got to read ALL their library books and then some. After a while Areyna came in and asked "What's next?" They obeyed well as I instructed them from my "feeding throne" on the last minute stuff that needed to be done in order to get them in bed. So, I still have a lot to learn but I'm working on it. I still think it's the easiest transition out of all 3 of the kids. We'll see how a whole weekend goes when Josh leaves for a youth retreat later on this month. Picking toys is not easy when it comes to thinking about safety. There is a toy website called ebeanstalk who has great baby toys and toys for 1 year olds etc. They are dedicated to selecting good, safe learning toys. They allowed me to test a toy with Areyna and Zeke and write a review about it. The toy they sent is called "Activity Bus" from Plan Toys, who makes eco-friendly wooden toys. As soon as the toy arrived I KNEW Areyna would like it. It is a wooden bus that opens up and becomes a classroom. There are 3 removable desks and a chalkboard along with a teacher and 1 student. It really is pretty cute. Areyna played school with it for 2 days straight=) Zeke liked it too, although he just wanted to carry the little people around or race the bus on the floor, HA! Overall, it is a Great, eco-friendly toy and very age appropriate for my kids. I thought it was cool that it is made out of recycled wood and that the paint is all natural. I was a little afraid that it would leave marks on our wood floors but it didn't. The only thing that I didn't like about it was that the people's legs didn't stay bent under the desk. Areyna would get a little frustrated when the student would topple out of his seat because his legs just wouldn't stay bent. Other than than, I definitely recommend this toy. 3- A lot less "racing" Zeke's Spiderman car around the living room while Micaiah is in the swing. Makes for an awful jumpy baby. 4- A lot more family bonding to assure Areyna and Zeke that we love them SO MUCH too! Well, Micaiah turns 1 week old today. I can't believe it's already been a week. We are still adjusting here, working on "happy hearts" and good attitudes but overall we are 1 big"ger" happy family=) My parents have been here helping out which has been Great! It has been so nice to have the extra hands to keep us fed and to help with Rainy and Zeke. Micaiah has adjusted well to having 2 older siblings. He can sleep through ANYTHING! Poppie (Josh's dad) dropped by to see Micaiah on his way back home from preaching in SC. Poppie: "Can Micaiah play with your cars?" Poppie: "Can Micaiah eat lunch with you?" Zeke: (without hesitation) "No poppie, because my mommy has his milk in her boobies!" I turn bright red while Josh and I both busted out laughing! 4:30am - Woke up with contractions. 10 min. apart. 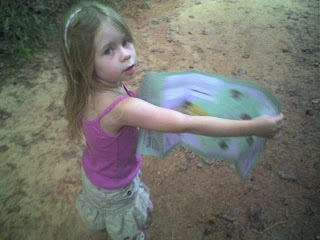 *Spend the day trying to stay busy...and active=) Taking walks, running errands, keeping up with the kids... This is typical of all of my labors. Very slow and inconsistent. This goes on until about 5pm. 5pm - The contractions begin getting closer together and stronger. I decided to get a shower and by the time I was done they were 5-6 minutes apart. 6:30pm - Josh is in the middle of dinner when contractions begin to be 2-3 min. apart. I tell him I think it's time...right now! 7:30pm - Get to the hospital and am admitted right away. They check me and I am ONLY 4 cm. They feel my water sack though, which was causing tremendous pressure. As soon as they lay me down and put the monitors on my contractions slow WAY down and the pain level decreases tremendously. This is also typical of my other deliveries. I have tons of painful contractions and get stuck in the dilation process and can't progress. *After laying and being monitored for an hour with not much progression the nurse keeps telling me that this is just "early labor" and starts talking about sending me home. I try to tell her that my other pregnancies were just like this and that this, in fact, IS THE DAY HE WILL BE BORN. She wasn't convinced. 9pm - Begin walking the halls in hopes of picking things up a bit. As soon as I get off the bed the contractions DEF. begin again and even stronger than before. 10pm - After an hour of walking the halls they check me again and I'm only 5-6cm along. My contractions were beginning to get unbearable and they were STILL talking about sending me home, saying this was just "early labor". After the nurse left me laying on the bed with the monitors again it began. 10:30pm - The contractions were beginning to hurt so bad that I couldn't help but call out! One contraction made me feel like I had to push. I turned over and looked Josh in the eyes and said (okay, firmly commanded) him to "Call the nurses RIGHT NOW and tell them I HAVE TO PUSH!!!!!!!!!!" Josh, thinking, "baby you can't push when you're only 6cm." reluctantly called the nurses in. As if the screams weren't giving it away. The nurses came in and couldn't figure out what was going on. One of the nurses decided to check me during a contraction and I was 8cm DURING a contraction. 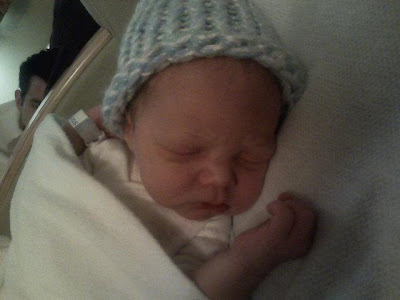 1-The epidural slowed delivery down by HOURS with my other 2 and I WAS NOT GOING HOME! This baby was coming out TONIGHT! 2-My contractions were so hard and so close together that I was afraid of the needle hitting my spine during contractions. I was just plain scared! *The Dr. came in to see what was going on and realized that my water sack wasn't breaking and that was the reason I wasn't dilating...because it was blocking the head from dropping to cause dilation. So, he said "alright I'm gonna break your water". Seconds later he says, okay, "you want to try to push?" 3 sets of contractions and pushing later and he was here! So, that's the short of it. He made it and he is healthy. I had no tearing or ripping or stitches or anything! God is so good. Everything happened so fast once things got rolling and the Dr. had to remind us to take a picture. This is right after delivery with NO epidural! Rainy and Zeke LOVE their little brother=) Zeke was intrigued by his belly button. Zeke especially is really going to take ownership of Micaiah. It is so sweet. I'll recap our story tomorrow and try to put some more pictures up. 5- We're all GREAT and glad to be home! Today is happy day and we could all use a laugh so I'd love for you to tell me something that has made you laugh or that is simply too funny or cute or silly not to share. Example: Last night I just read this post about something my best friend's little girl said to her. Too cute! Who knows, maybe this could bring on a few contractions that could result in an even happier day! By the time I reached this mark with Areyna I was a sobbing basket-case feeling like I'd be pregnant FOREVER and wondering if the day would EVER come. With Zeke I was still pretty emotional when the due date came, but at least he came ON his due date. Baby #3 and I am still learning but I have been a lot LESS emotional, deciding to just live my life like any other day, even though mobility and flexibility are more and more limited=) I WILL have a plan for every day to stay busy and optimistic finding reasons to smile and laugh along the way. Yesterday my mom and I went grocery shopping to fill our bare pantry and refrigerator since we'd been gone for almost 2 weeks. That pretty much exhausted me for the rest of the day. 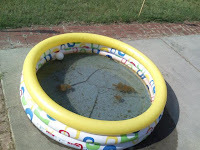 This picture does NOT give justice to the green fungus growing on the bottom and the top of the water...ewww! I washed a whole load of laundry tonight. Then, I dried that whole load of laundry. It wasn't until I pulled them out of the dryer (still smelling the dirtiness) that I realized that I had forgotten to put laundry detergent in when I washed them. Goodness gracious, it's time for this baby to come! We drove up to Smith Mountain Lake in VA last Saturday for the annual Via vacation. It was a good diversion from the growing anticipation of Micaiah's arrival. My doctor was a little hesitant to let me travel 3 1/2 hours away but knowing that I could hop in the car at any sign of labor, and knowing my track record with late and slow deliveries, he gave me the green light. We ALL had a GREAT time. I'll be posting pictures (I did get a couple) this week so stay tuned. Josh was scheduled to play at a church in Raleigh, NC yesterday and we had just planned on me staying home in case labor came on but he talked me into one last road trip=) I joined him for yet another 3 1/2 trip in the car 3 days before the due date. We might as well keep it interesting...and keep me occupied as I grow more and more antsy. Today is another day in the studio to hopefully finish up some vocals and violin tracking on "All That Glitters" and then my mom flies in tonight to help with the kids while we wait together, so that will be a nice diversion.